What has been described as a vicious attack on a horse by a farrier is under investigation according to the Edgefield County Sheriff’s Office. The alleged offense occurred Tuesday, Aug. 27, at a home on Cedar Creek Road in Edgefield. 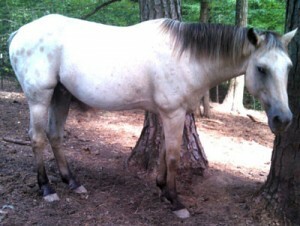 Jenny Jones, owner of the appaloosa horse in question told The Advertiser in an interview, Monday, Sept. 2, that the farrier, from Thompson, GA, was someone the family had known from previous dealings but that the man had never done farrier work for the family before. However, Mrs. Jones said it was this previous connection that made the family feel confident in leaving the farrier alone with Mrs. Jones’ teenage daughter while he worked on the horse. Mrs. Jones says the horse, a rescued equine, has had no previous issues with having his hooves tended. In fact, she stated the farrier had already shoed both front hooves when, as the farrier began to work on the horse’s back hooves, the horse tugged against the farrier. To this action, Mrs. Jones stated the farrier became angry and yelled at her daughter to control her horse. Mrs. Jones said her daughter asked what actions he wished her to take. At that point, the farrier allegedly not only became angry at her daughter but also began hitting the horse about the shoulder and ribs with his farrier’s hammer. Mrs. Jones said her daughter screamed at the man to leave even trying to pay him his fee to get him off the property. However, the farrier refused the money but instead reached down and “yanked off” the shoes he had already put on the horse’s hooves. He then left the scene. The horse was treated by a veterinarian for his injuries, and a second farrier had to be called to fix the damage done to the horse’s hooves. The ECSO was also contacted in regards to this incident. According to their incident report, the responding officer noted blood on both of the horse’s back hooves as well as swelling on the horse’s right side around the rib and shoulder areas. Pictures of the injuries were taken by both the Joneses and the ECSO deputy. Mrs. Jones said the second farrier informed her that a lot of the horse’s hoof walls had been ripped away. “His feet are in pretty bad shape,” Mrs. Jones said. The horse is now undergoing hydrotherapy and daily wrapping but is expected to recover. The Advertiser attempted to call the accused farrier in this incident. However, he did not return our phone call. According to a spokesperson with the ECSO, this incident has been turned over to their investigations unit. The Advertiser will continue to follow this story and make updates if any charges are filed in this case. 2 Responses to "Attack of Horse Under Investigation"
If this farrier had done this with any of my horses he would have been placed under citizens arrest and held for the cops which here is a 45 minute wait.